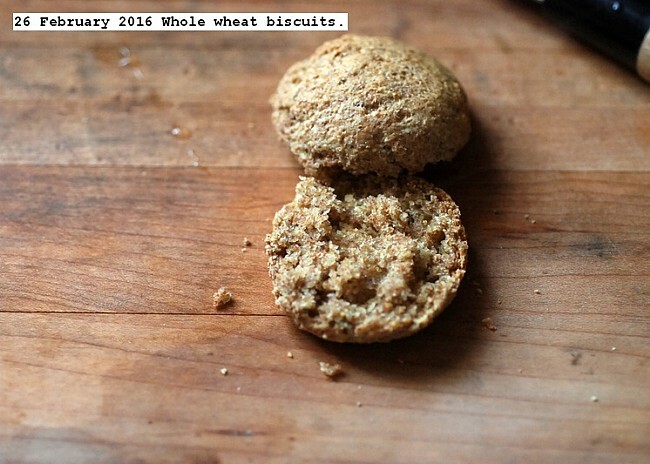 26 February 2016 Whole Wheat Biscuits. http://www.durgan.org/2016/February%202016/26%20February%202016%20Whole%20wheat%20biscuits./HTML/ 26 February 2016 Whole wheat biscuits. 4 cups whole wheat flour. I have a flour mill and grind the wheat grain. 2 cups of milk. Any type. Knead into a malleable ball and make small round balls and place on a non greased tray. Cook at 400F for 20 minutes. Easy and quick to make and are a filling replacement for commercial bread. This entry was posted in Uncategorized and tagged Whole Wheat Biscuits. Bookmark the permalink.